In 1286 King Alexander III of Scotland came to an unfortunate and unusual end. Born in 1241, he became king in 1249 when aged only seven. In 1251, aged ten, he was married to 11-year-old Margaret, the daughter of King Henry III of England. When he reached the age of 18 in 1259 and took up the reins of kingship in his own right, all seemed well for a long and successful reign and the production of suitable heirs. However, things started to go awry when Queen Margaret died in 1275. This tragedy was followed by the deaths of her two sons, Alexander’s heirs, in 1281 and 1284. He also lost his only daughter in childbirth in 1283, although her child, a daughter, survived and was therefore Alexander’s sole heir. In order for the royal succession to continue in the preferred male line, the king needed a new wife who could bear him more sons. He was therefore delighted to make a match with a French heiress, Yolande de Dreux, whom he married on 14th October 1285. By the following March there was no sign of the new queen being pregnant, but that did not cause Alexander undue concern. There appeared to be plenty of time for that to change, given that both Alexander and Yolande were still young and healthy. 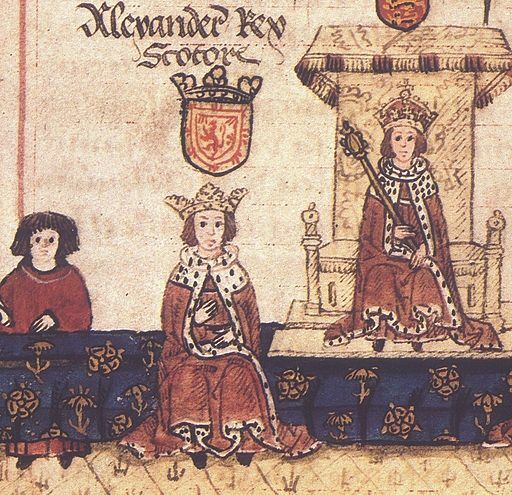 On 18th March 1286 Alexander was in Edinburgh while his wife was at the royal castle of Kinghorn, on the opposite side of the Firth of Forth. When his business was concluded Alexander decided to proceed straight to Kinghorn, despite the late hour and the fact that the journey involved crossing the Firth in bad weather and riding along the north shore in pitch darkness. The ferryman tried to dissuade him from making the two-mile crossing, but Alexander insisted on doing so and the boat did in fact get across safely. Further efforts were made to hold him back when he reached Inverkeithing, with offers to put him up for the night so that he could travel further the next day in daylight and better weather, but Alexander would not be dissuaded from reaching his wife as soon as possible. He therefore set off along the coast on horseback with two companions, but he never reached his destination. The king became separated from the other two horsemen in the darkness and he blundered on without knowing where he was going. The following morning the bodies of horse and rider were found on the seashore at the foot of a cliff, over which they had stumbled in the dark. The point is still known to this day as “King’s Crag”. With Alexander dead, and Queen Yolande not with child, the throne now technically belonged to Alexander’s 3-year-old grandchild, another Margaret. Guardians were appointed to look after matters, and it was widely expected that one of these would emerge as the true power in the land and be appointed as the new king, especially after young Margaret died at the age of six. However, King Edward I of England (Margaret’s great-uncle) now showed his hand and it soon became clear that no solution would be found that did not have his approval. The net result of Alexander’s foolish decision to ride along a clifftop at night was that the throne of Scotland stayed empty for six years and when the next king, John Balliol, took his seat in 1292 it was only as a puppet of the much more powerful monarch in the southern kingdom.